These continuing education courses provide high-quality training to water operators in Maine who are looking to renew their license. Our continuing education courses are approved by the State of Maine to count toward the number of Training Contact Hours (TCH) a water operator needs to qualify for renewal. 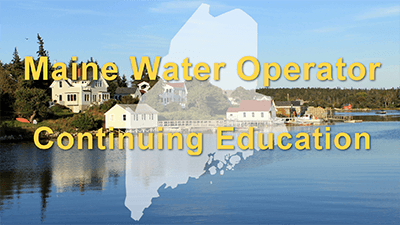 What are the continuing education requirements for Maine water operators? The continuing education requirements to renew a Maine water operator's license depends on the class of license held. Approved training contact hours need to be completed every 2 years before they expire. Our state approved online courses are designed to meet your renewal requirements. This 24 hour Class III/IV course will be covering Basic Electrical Concepts for Water Operators, Storage Tank Facilities, Pumps and Motors, Pipelines, Groundwater Wells, Membrane Processes, Advanced Oxidation & UV Disinfection, Corrosion Control, Coagulation & Flocculation, and more. This 18 hour Class II course will be covering Basic Electrical Concepts for Water Operators, Storage Tank Facilities, Pumps & Motors, Groundwater Wells, Membraine Processes, Advanced Oxidation & UV Disinfection, Source Water Issues & Pre-Treatment, Pipelines & Meters, and Valves & Hydrants. This 12 hour Class I Course will be covering Basic Electrical Concepts for Water Operators, Pumps & Motors, Groundwater Wells, Disinfection, Sourse Water Issues & Pre-Treatment, Pipelines, and Storage Tank Facilities. This 6 hour Distribution oriented VSWS class will be covering Meters, Valves, Hydrants & Pipelines, Storage Tank Facilities, and Basic Electrical Concepts for Water Operators. This 6 hour Treatment oriented VSWS class will be covering Corrosion Control and Sedimentation & Filtration. This course will fulfill 3 of your required hours for Maine water operators. This course will fulfill 2.5 of your required hours for Maine water operators. This letter serves to confirm the status of AYPO, LLC as a recognized provider of water operator continuing education. Should you have any questions, please feel free to contact me at (207) 287-5695, or by fax at (207) 287-4172.